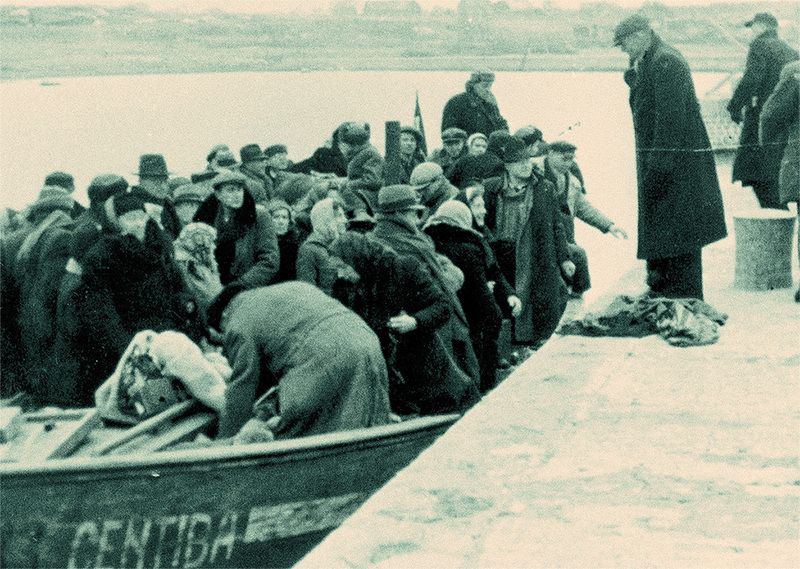 In The Trails Of The Boat Refugees is part of the exhibition “Stories of Migration – then and now” at the National Library of Latvia, April 25 – May 21 2018. The exhibition was produced by the Swedish Embassy in Tallinn and in Riga, the Swedish Institute and the Museum of Occupations in Estonia. In 2016 BAC organized a youth project, which followed in the trails of the many boat journeys that took place at the end of the Second World War, when people from the Baltic States fled the German and Soviet occupations. The dangerous crossings over the Baltic Sea took place in small and overloaded boats, and more than 10,000 people managed to reach Gotland. 12 youth: 6 from Gotland, and 2 from the each of the Baltic states of Estonia, Latvia and Lithuania participated in the project, which included a boat journey from Ventspils to Slite on a former fishing boat. Each participant where given an account of a person who had fled, and asked to reflect on, and identify themselves with, their story. On Gotland, the group met some current asylum seekers and heard their story. A film crew followed the participants’ thoughts and experience and the result of the project is a film documentation. The project has also had several public presentations, including art exhibitions and film screenings in all the participating countries. The aim of the project was not intended to only commemorate the past, but also to promote a deeper understanding of the current refugee situation. Not long ago was the Baltic Sea divided by the EU border, and the project also aimed at creating more co-operation within the Baltic Sea Region. Participants Agnė Vaiciukevičiūtė, LT. Andrei Ossipov, EE. Anete Skuja, LV. Astrid Åkerblom, SE. Edward Lundberg, SE. Johan Holmert, SE. Jonas Haraldsson, SE. Kipras Černiauskas, LT. Kätlin Kulbin, EE. Manfred Engström, SE. Patrīcija Keiša, LV. Zaimon Sharr, SE. Organized by BAC- Baltic Art Center. Conceptualized by Anna Viktoria Norberg. Project leader and research: Liene Vecvagare and Anete Jansone. Film-maker: Sandra Fröberg. Workshop by BAC Production-in-Residence artist: Åsa Sonjasdotter. International Partnership National Library of Latvia, Swedish Embassy in Riga, Kaņepes Culture Centre (Kaņepes Kultūras centrs), Riga, Latvia, Kirtimai Culture Centre, Vilnius, Lithuania, The Museum of Occupations in Estonia, The Swedish Embassy in Tallinn, Vilnius Academy of Arts - Monumental Arts program, Lithuania. Local Partnership Cementa Slite Fabriken, Film Gotland, Fenix ungkulturhus, Fårö Församlingshem, Gotland Art Week, Gotlands Folkhögskola, Gutegymnasiet, Holmerts bildarkiv, iVisby, Joda Stora Salen, Lärbro Krigssjukhus, Pedersén & Co, Slite Sjöfartsmuseum, Slite utveckling. Support The project was financed by the Swedish Institute. Part of the exhibition “Stories of Migration – then and now”. Part of the summer exhibition “Stories of Migration – then and now”. A silo on the Cementa Factory in Slite was painted by Vilnius Academy Art students from the Monumental Arts program during Gotland Art Week 2016.